Home Health How to Cure Canker Sores Naturally and Quickly? Learn how to cure canker sores quickly, using natural remedies, and get rid of the annoying pain before it gets worse. Canker sores usually lasts between one and two weeks. Although are not a serious health issue, it is better to give them a treatment to accelerate their recovery. Discover some remedies and learn how to cure canker sores naturally. Canker sores are small ulcers or lesions that develop in the mucosa of the mouth or gums. Some are painful, but usually do not produce serious symptoms. In fact, most disappear by themselves in a period of two weeks. Do you want to learn how to cure canker sores naturally and quickly? There are some remedies of natural origin that help to accelerate the recovery process, minimizing discomfort. However, in many of these options its effectiveness is based only on anecdotal data. Despite this, using them is safe and can provide relief. 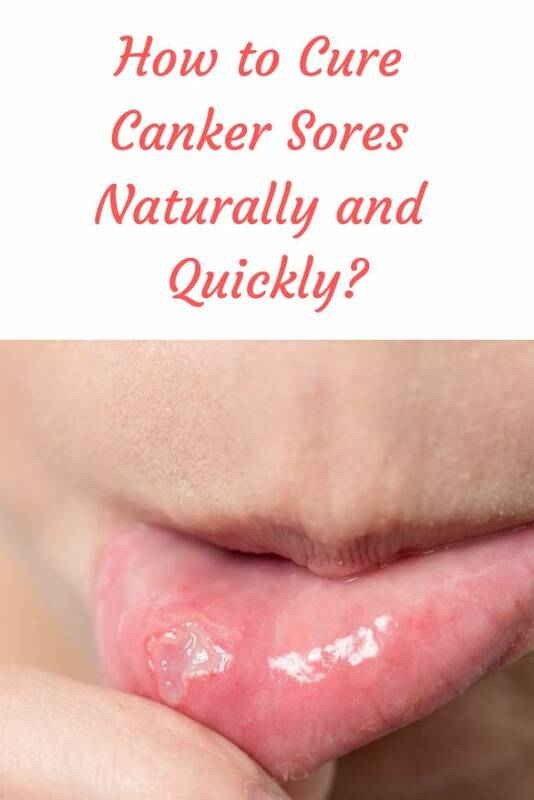 How to cure canker sores quickly? Canker sores are one of the most frequent oral problems in the population. Its size is about 5 millimeters and its whitish color surrounded by a red area. Unlike cold sores, they are not contagious and usually disappear easily. Here we share 5 options to quickly cure a canker sore. Honey creates a protective layer and helps the healing of canker sores. Bee honey is one of the best natural ingredients to treat the conditions that afflicts the health of the skin. According to an investigation made in 2014, its application can reduce the pain, size and redness of canker sores. It also protects the affected area against infections. Rub a small amount of honey on the affected area 3 or 4 times a day. Recognized for its multiple medicinal and cosmetic applications, coconut oil is another effective solution to quickly cure a canker sore. Its antimicrobial properties help to inhibit the action of bacteria and prevents lesions from becoming infected. First, dip a piece of cotton in coconut oil. Later, rub it on the canker sore with care. Repeat its use 3 or 4 times a day until the lesion is healed. Read more: Put Coconut Oil At Night On Face And Watch Miracles Happen! The cleanliness of the area is essential, so an antiseptic such as oxygenated water will help the healing of canker sores. The topical application of a solution with hydrogen peroxide can promote the healing of canker sore when cleaning and disinfecting the sore. In addition, due to its antiseptic power, it is ideal to prevent bacteria from proliferating in the affected area. First, dilute a tablespoon of 3% oxygenated water in a tablespoon of water. Next, dip a piece of cotton into the mixture and apply it to the sore. Don’t forget to use it twice or three times a day. If the sores are internal, dilute one tablespoon of hydrogen peroxide in half a glass of water. Then, swish for 2 minutes. Spit the solution and repeat its use 3 times a day. In addition to helping to quickly heal a canker sore, chamomile is used to accelerate the relief of skin wounds and allergies. Its content of azulene and levomenol gives it anti-inflammatory and antiseptic properties that act positively against these problems. First, prepare a concentrated chamomile tea. Then, dip a clean cloth or piece of cotton into the liquid. Apply on the affected area and let it act for 5 minutes. Optionally, apply a bag of chamomile tea. The probiotics contained in yogurt help to maintain a healthy flora that prevents the access of pathogenic microorganisms. The exact cause of canker sores is not established. However, among the detonating factors is included H. pylori infection and inflammatory bowel diseases. Therefore, the consumption and application of natural yogurt can support the relief of this condition. This product concentrates probiotics or live cultures of bacteria that help cope with H. pylori. They also regulate cutaneous pH and decrease the risk of infections. Consume a cup of yogurt a day. Optionally, apply some yogurt on the sore. Let it act without wiping and repeat its use 3 times a day. In most cases, a canker sore can be quickly cured without the need to see a doctor. However, in others the discomfort is prolonged or tend to complicate. If this happens, it is best to request a check to determine what is due. You have multiple canker sores. You notice that new canker sores are formed before the others have completely healed. The ulcer does not go away after two weeks. The sores spread through the lips. The pain caused prevents eating or drinking normally. You have moderate or high fever. Do you notice a canker sore in your mouth or surroundings? Try one of the mentioned remedies first. You will feel more relief and you will notice that it disappears faster. If you cannot improve it, consult a doctor. Don’t forget to SHARE how to cure canker sores with your friends and family on your social networks!